Cape White-eye ( Zosterops virens fam. Zosteropidae) Kruger Park Birds & Birding. The Cape White-eye (Latin name Zosterops virens) is described in Roberts Birds of Southern Africa, 7th Edition. This bird has a unique Roberts number of 796 and you will find a full description of this bird on page 822 also a picture of the Cape White-eye on page 977. The Cape White-eye belongs to the family of birds classified as Zosteropidae. According to the Percy FitzPatrick Institute of African Ornithology the Cape White-eye is also known by these other names: Pale White-eye, Green White-eye, Vaal River White-eye, Natal Zosterops. Endemic species is one that is confined to a specific country or region. For example certain birds endemic to South Africa only exist in that country. One such example is the Cape White-eye and this species depends upon a particular habitat for survival. Destroy that habitat and the bird will possibly be lost forever. In terms of distribution of the Cape White-eye in the Kruger National Park you may not see it in all areas. Cape White-eye : see above distribution map. 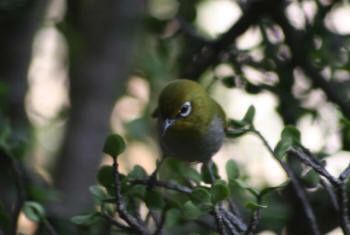 The preferred habitats for Cape White-eye are: woodlands and grasslands and riverine areas. The Cape White-eye is also at home in wetland and bushveld areas. You will normally see the Cape White-eye in pairs or flocks and not as single birds.